This three bedroom 3rd floor Jaco Beachfront condo is being offered fully loaded, in immaculate condition, with all luxury furnishings, appliances and finishes included. The floor plan is 1635 sq. ft, with one of the best locations in the complex. The patio and bedrooms boast unobstructed, breathtaking ocean views as well as views to the jungle covered private cove of Monkey Beach. 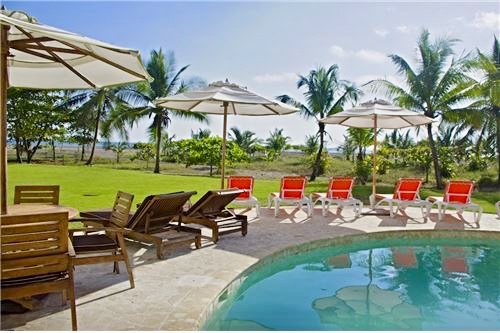 The residence has central air, brand-new granite counter-tops in kitchen, travertine tiled bathrooms (including Jacuzzi tub in Master bedroom and marble counter-tops), and custom furniture built using local tropical hardwoods by famed craftsman from Sarchi, Costa Rica. The large balcony is perfect for star gazing, sunset happy hour, or morning coffee, while taking in the glory of the natural scene before you. These views can never be blocked as this is the front row of 100% titled beachfront location. There is already $10,000 to $15,000 USA dollars of rental income for future bookings available for the new owner (if desired). This unit has new energy-efficient central air with a thermostat that can be controlled remotely. Tres Regalos is a boutique luxury condominium of only 30 units, close to all amenities in town, as well as Croc´s Casino and Resort, yet this area retains it´s quiet and secluded amazing natural atmosphere. The gated condominium complex has many amenities like pool, jacuzzi, 24-hour security, covered parking, two elevators, water backup system and an exclusive beach club. This is one of the few beachfront developments that allow pets. Shawn and Hannah moved to Jaco Beach, Costa Rica over 12 years ago and are both permanent residents of Costa Rica who are legally allowed to work in Costa Rica as Realtors. As professional Realtors, Shawn and Hannah focus their efforts on finding the perfect, house, condo, lot or commercial property for their clients on the Central Pacific Coast. They cover the areas of Punta Leona, Los Sueños, Jaco Beach, Hermosa Beach, Esterillos and Bejuco.